My Original 18th Century Fire Steel Update. Some of you may remember that I acquired an original 18th century fire steel some time ago. I decided to add it to my equipment replacing the copy that I had been using. I found however that the original did not spark as well as the copy, so I re-hardened the steel in the fire. The results were no better, but I decided to keep it & use it anyway. If that was the way it was, then that is how I will use it. I have seen in some videos copies of fire steels that shed an enormous amount of sparks as if they are coated with some radioactive material. 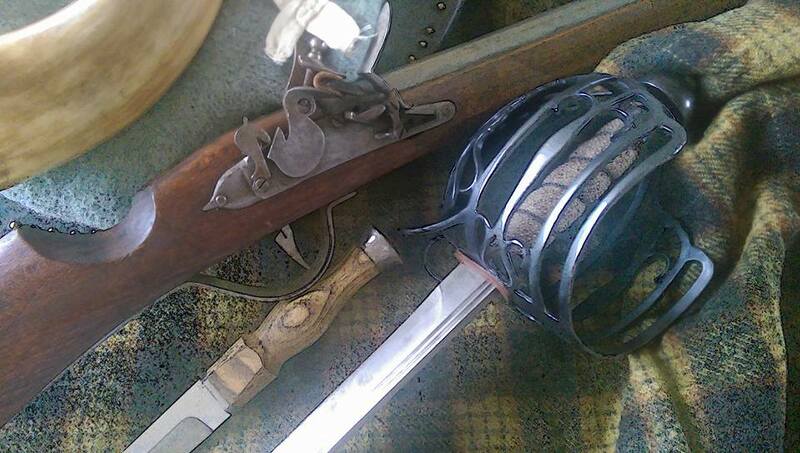 There was such a product sold many years ago for coating the steel on a flintlock, but I think it was removed from sale!!! 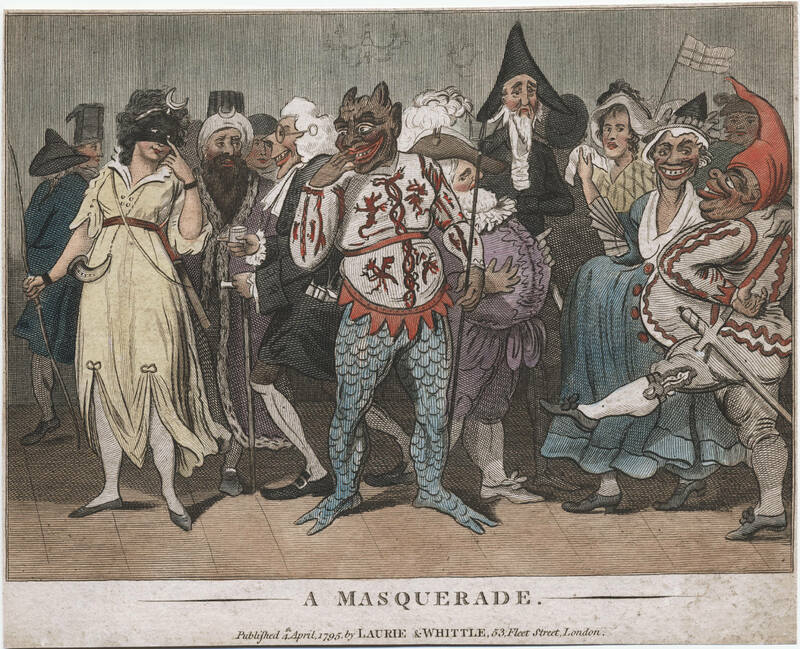 The New England Colonial Living History Group 1680-1760 will be holding it's annual Winter Solstice masquerade Party on Saturday the 18th of June 2016. TIME. Anytime after 4 pm though I doubt any food will be served before 6pm. FOOD. Probably pumpkin soup & bread at least. Bring a "plate" if you wish & something to put your soup in. PLACE. Linstock House garden in Wychwood Forest. WHO. Members & invited friends. BYOG. Bring your own drinking vessel please. Wine bottles are acceptable but beer bottles are not. There will be children present so mind your language & your behavour please. 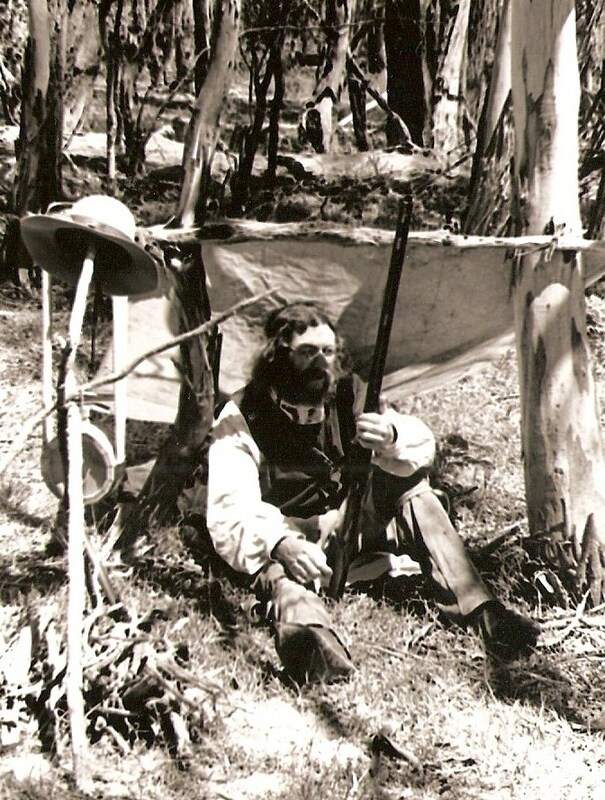 Early Mountain Man days camping in the woods. It really was a lifestyle back then, no water on tap, no electricity, & yes I had to hunt to put meat on the table. That is what it was called when I first got into this hobby/lifestyle that we now call Living History. Back then we made “primitive stuff”, if it was made from natural materials, then it was okay. Later I learned that in fact it was not “okay”. Just because it was made from natural materials, didn’t make it authentic to the period. 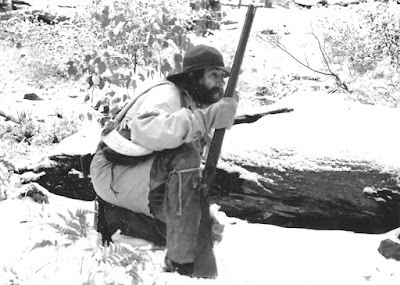 The period then was the 19th century, everyone wanted to be a “Mountain Man” regardless of whether we had a horse or not, & of course we had to have a Hawken rifle! 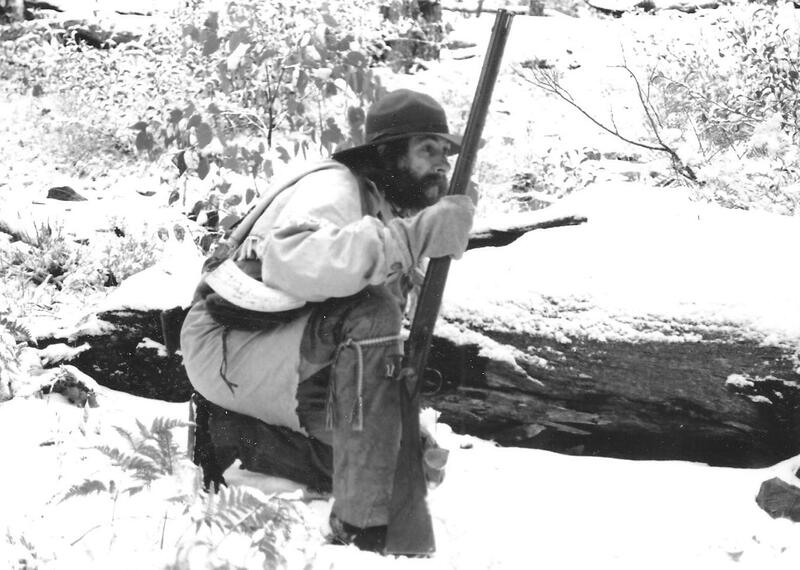 The Hawken rifle was another mistake, because it was not as popular as it was made out to be. 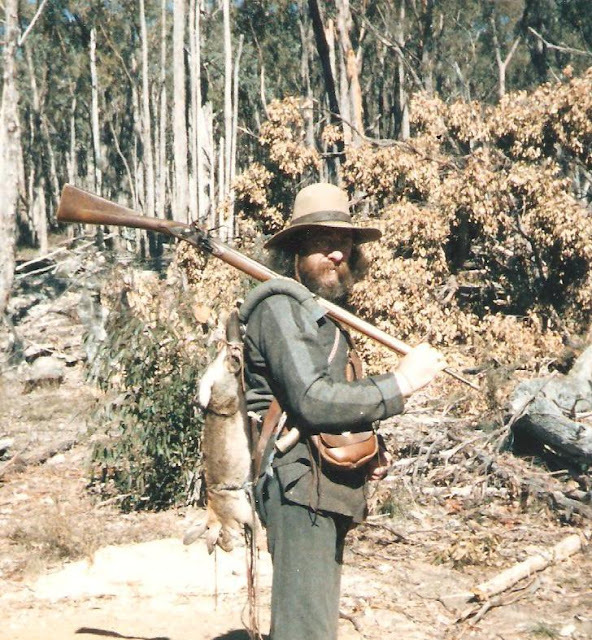 People moving into the mountains to trap beaver for furs carried whatever gun they could lay their hands on, probably spending more money on traps than on their gun. Another mistake was using a caplock gun. At the time of the Mountain Man & the height of the beaver fur trade, 1825 to 1840, flintlocks were still preferred to caplocks; the flintlock being more reliable when you are far from the settlements & a new supply of percussion caps. But I enjoyed those days just the same, though had I known the right path when I started, I would not have wasted so much money on items that I did not need. 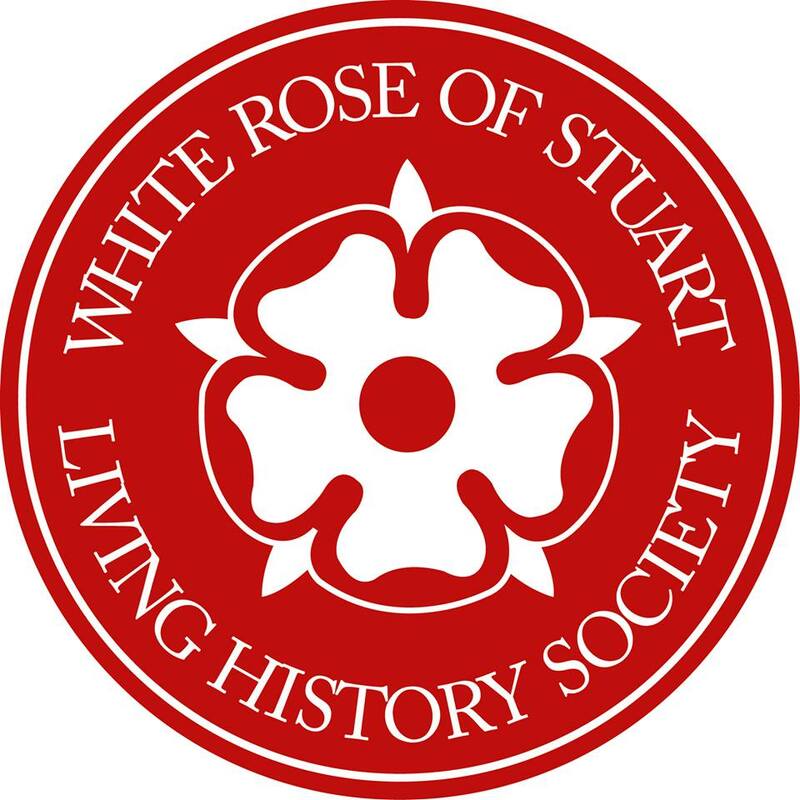 But having found the right way to go about things; research first before doing anything, then I found it was just as much fun starting over again, this time, for me at least, with a new persona & an earlier period, the early to mid 18th century. Now all my spare time was spent in further research & making new equipment. My wife helped me with the clothing as she is far more skilled at pattern making & sewing. I made my own leather leggings & woodland Indian style center seam moccasins, I also finger wove my legging garters & beaded the fringe with French glass beads. Then there was the skills. Fortunately I was born & raised in the country, so I learnt many of the life skills when I was very young. There was however still many more skills to learn before I could consider myself a common woodsman of the 18th century. Again this learning was a lot of fun, just like the making of my equipment was, except that the skills learning never ends, experience being the teacher, & I consider 40 years later that I still have much to learn. Improving, but still a ways to go. My hair turns grey, & finally I get there. "Redemptioners and indentured servants in the colony and commonwealth of Pennsylvania" A Link. Please folks, remember we are a living history society. We are concerned with the Jacobite Rebellions of the 18thC. We are not a political group, we are a living history group. 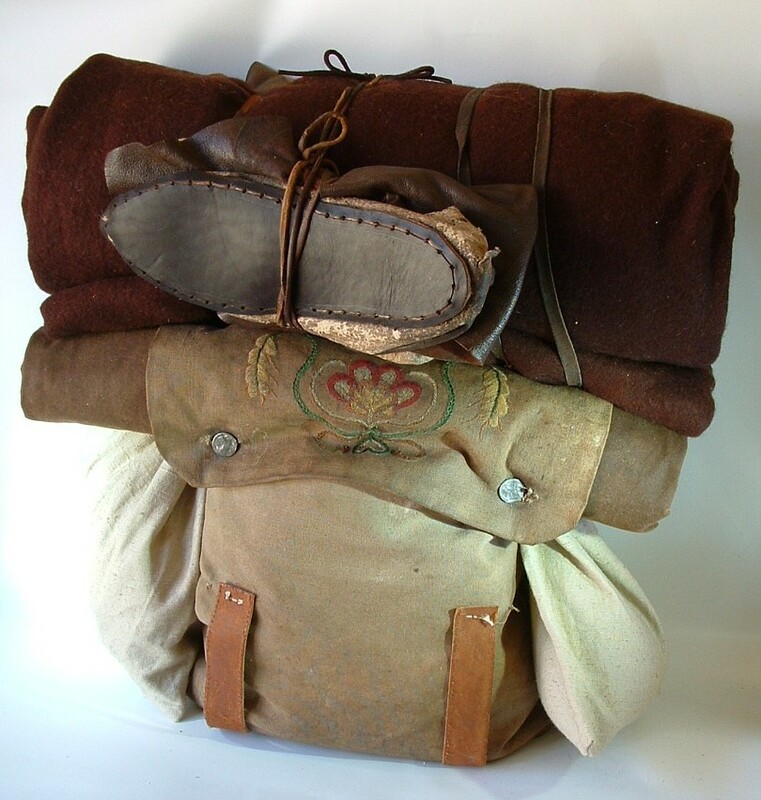 We research, study, make accurate reproductions of period kit, and re-enact the period. Any modern politics, or defamatory remarks will be deleted. Feel free to ask questions, or contact us for information on our activities. Thank you. About Gunpowder. A Gutenberg File. Gunpowder, also known since the late 19th century as black powder, was the first chemical explosive and the only one known until the mid-1800s. It is a mixture of sulfur, charcoal, and potassium nitrate (saltpeter)—with the sulfur and charcoal acting as fuels, while the saltpetre works as an oxidizer. Because of its burning properties and the amount of heat and gas volume that it generates, gunpowder has been widely used as a propellant in firearms and as a pyrotechnic composition in fireworks. Gunpowder was, according to prevailing academic consensus, invented in the 9th century in China, and the earliest record of a written formula for gunpowder appears in the 11th century Song Dynasty text, Wujing Zongyao. This discovery led to the invention offireworks and the earliest gunpowder weapons in China. In the centuries following the Chinese discovery, gunpowder weapons began appearing in the Arab world, Europe, and India. The technology spread from China through the Middle East, and then into Europe.The earliest Western accounts of gunpowder appear in texts written by English philosopher Roger Bacon in the 13th century. Gunpowder is classified as a low explosive because of its relatively slow decomposition rate and consequently low brisance. Low explosives deflagrate (i.e., burn) at subsonic speeds, whereas high explosives detonate, producing a supersonic wave. Gunpowder's burning rate increases with pressure, so it will burst containers if contained but otherwise just burns in the open. Ignition of the powder packed behind a bullet must generate enough pressure to force it from the muzzle at high speed, but not enough to rupture the gun barrel. Gunpowder thus makes a good propellant, but is less suitable for shattering rock or fortifications. Gunpowder was widely used to fill artillery shells and in mining and civil engineering to blast rock roughly until the second half of the 19th century, when the first high explosives (nitro-explosives) were discovered. Gunpowder is no longer used in modern explosive military warheads, nor is it used as main explosive in mining operations due to its cost relative to that of newer alternatives such as ammonium nitrate/fuel oil (ANFO). Black powder is still used as a delay element in various munitions where its slow-burning properties are valuable. Formulations used in blasting rock (such as in quarrying) are called blasting powder. Gunpowder was invented in China. Chinese military forces used gunpowder-based weapons (i.e. rockets, guns, cannons) and explosives (i.e. grenades and different types ofbombs) against the Mongols when the Mongols attempted to invade and breach city fortifications on China's northern borders. After the Mongols conquered China and founded the Yuan Dynasty, they used the Chinese gunpowder-based weapons technology in their attempted invasion of Japan; they also used gunpowder to fuel rockets. The mainstream scholarly consensus is that gunpowder was invented in China, spread through the Middle East, and then into Europe, although there is a dispute over how much the Chinese advancements in gunpowder warfare influenced later advancements in the Middle East and Europe. The spread of gunpowder across Asia from China is widely attributed to the Mongols. One of the first examples of Europeans encountering gunpowder and firearms is at the Battle of Mohi in 1241. At this battle the Mongols not only used gunpowder in early Chinese firearms but in the earliest grenades as well. A major problem confronting the study of the early history of gunpowder is ready access to sources close to the events described. Often enough, the first records potentially describing use of gunpowder in warfare were written several centuries after the fact, and may well have been colored by the contemporary experiences of the chronicler. It is also difficult to accurately translate original alchemy texts, especially medieval Chinese texts which employ metaphor to describe unexplained phenomena, into contemporary scientific language with its rigidly defined terminology. The difficulty in translation has given rise to errors or loose interpretations bordering on artistic licence. Early writings potentially mentioning gunpowder are sometimes marked by a linguistic process where old words acquired new meanings. For instance, the Arabic word naft transitioned from denoting naphta to denoting gunpowder, and the Chinese word pao evolved from meaning catapult to referring to cannon. According to science and technology historian Bert S. Hall: "It goes without saying, however, that historians bent on special pleading, or simply with axes of their own to grind, can find rich material in these terminological thickets." Saltpeter was known to the Chinese by the mid-1st century AD and there is strong evidence of the use of saltpeter and sulfur in various largely medicinal combinations. A Chinese alchemical text dated 492 noted saltpeter burnt with a purple flame, providing a practical and reliable means of distinguishing it from other inorganic salts, thus enabling alchemists to evaluate and compare purification techniques; the earliest Latin accounts of saltpeter purification are dated after 1200. The first mention of a mixture resembling gunpowder appeared in Taishang Shengzu Danjing Mijue by Qing Xuzi (c. 808); it describes mixing six parts sulfur to six parts saltpeter to one part birthwort herb (which would provide carbon). The first reference to the incendiary properties of such mixtures is the passage of the Zhenyuan miaodao yaolüe, a Taoist text tentatively dated to the mid-9th century AD: "Some have heated together sulfur, realgar and saltpeter with honey; smoke and flames result, so that their hands and faces have been burnt, and even the whole house where they were working burned down." The Chinese word for "gunpowder" isChinese: 火药/火藥; pinyin: huŏ yào /xuou yɑʊ/, which literally means "Fire Medicine"; however this name only came into use some centuries after the mixture's discovery. By the 9th century Taoist monks or alchemists searching for an elixir of immortality had serendipitously stumbled upon gunpowder. The Chinese wasted little time in applying gunpowder to the development of weapons, and in the centuries that followed, they produced a variety of gunpowder weapons, including flamethrowers, rockets, bombs, and land mines, before inventing guns as a projectile weapon. Archaeological evidence of a hand cannon has been excavated in Manchuria dated from the late 1200s and the shells of explosive bombs have been discovered in a shipwreck off the shore of Japan dated from 1281, during the Mongol invasions of Japan. The Chinese "Wu Ching Tsung Yao" (Complete Essentials from the Military Classics), written by Tseng Kung-Liang between 1040–1044, provides encyclopedia references to a variety of mixtures which included petrochemicals, as well as garlic and honey. A slow match for flame throwing mechanisms using the siphon principle and for fireworks and rockets are mentioned. The mixture formulas in this book do not contain enough saltpeter to create an explosive however; being limited to at most 50% saltpeter, they produce an incendiary. The Essentials was however written by a Song Dynasty court bureaucrat, and there's little evidence that it had any immediate impact on warfare; there is no mention of gunpowder use in the chronicles of the wars against the Tanguts in the eleventh century, and China was otherwise mostly at peace during this century. The first chronicled use of "fire spears" (or "fire lances") is at the siege of De'an in 1132. The Muslims acquired knowledge of gunpowder some time between 1240 and 1280, by which time the Syrian Hasan al-Rammah had written, in Arabic, recipes for gunpowder, instructions for the purification of saltpeter, and descriptions of gunpowder incendiaries. Gunpowder arrived in the Middle East, possibly through India, from China. This is implied by al-Rammah's usage of "terms that suggested he derived his knowledge from Chinese sources" and his references to saltpeter as "Chinese snow", fireworks as "Chinese flowers" and rockets as "Chinese arrows". However, because al-Rammah attributes his material to "his father and forefathers", al-Hassan argues that gunpowder became prevalent in Syria and Egypt by "the end of the twelfth century or the beginning of the thirteenth". Al-Hassan claims that in the Battle of Ain Jalut of 1260, the Mamluks used against the Mongols in "the first cannon in history" gunpowder formula with near-identical ideal composition ratios for explosive gunpowder. Other historians urge caution regarding claims of Islamic firearms use in the 1204-1324 period as late medieval Arabic texts used the same word for gunpowder, naft, that they used for an earlier incendiary naptha. Khan claims that it was invading Mongols who introduced gunpowder to the Islamic world and cites Mamluk antagonism towards early musketeers in their infantry as an example of how gunpowder weapons were not always met with open acceptance in the Middle East. Similarly, the refusal of their Qizilbash forces to use firearms contributed to the Safavid rout at Chaldiran in 1514. The earliest surviving documentary evidence for the use of the hand cannon, considered the oldest type of portable firearm and a forerunner of the handgun, are from several Arabic manuscripts dated to the 14th century. Al-Hassan argues that these are based on earlier originals and that they report hand-held cannons being used by the Mamluks at the Battle of Ain Jalut in 1260. Hasan al-Rammah included 107 gunpowder recipes in his text al-Furusiyyah wa al-Manasib al-Harbiyya (The Book of Military Horsemanship and Ingenious War Devices), 22 of which are for rockets. If one takes the median of 17 of these 22 compositions for rockets (75% nitrates, 9.06% sulfur, and 15.94% carbon), it is nearly identical to the modern reported ideal gunpowder recipe of 75% potassium nitrate, 10% sulfur, and 15% carbon. The state-controlled manufacture of gunpowder by the Ottoman Empire through early supply chains to obtain salpeter, sulfur and high-quality charcoal from oaks in Anatolia contributed significantly to its expansion the 15th and 18th century. It was not until later in the 19th century when the syndicalist production of Turkish gun powder was greatly reduced, which coincided with the decline of its military might. Several sources mention Chinese firearms and gunpowder weapons being deployed by the Mongols against European forces at theBattle of Mohi in 1241. Professor Kenneth Warren Chase credits the Mongols for introducing into Europe gunpowder and its associated weaponry. C. F. Temler interprets Peter, Bishop of Leon, as reporting the use of cannon in Seville in 1248. In Europe, one of the first mentions of gunpowder use appears in a passage found in Roger Bacon's Opus Maius and Opus Tertium in what has been interpreted as being firecrackers. The most telling passage reads: "We have an example of these things (that act on the senses) in [the sound and fire of] that children's toy which is made in many [diverse] parts of the world; i.e. a device no bigger than one's thumb. From the violence of that salt called saltpetre [together with sulphur and willow charcoal, combined into a powder] so horrible a sound is made by the bursting of a thing so small, no more than a bit of parchment [containing it], that we find [the ear assaulted by a noise] exceeding the roar of strong thunder, and a flash brighter than the most brilliant lightning." In early 20th century, British artillery officer Henry William Lovett Hime proposed that another work tentatively attributed to Bacon, Epistola de Secretis Operibus Artis et Naturae, et de Nullitate Magiae contained an encrypted formula for gunpowder. This claim has been disputed by historians of science including Lynn Thorndike, John Maxson Stillman and George Sarton and by Bacon's editor Robert Steele, both in terms of authenticity of the work, and with respect to the decryption method. In any case, the formula claimed to have been decrypted (7:5:5 saltpeter:charcoal:sulfur) is not useful for firearms use or even firecrackers, burning slowly and producing mostly smoke. The Liber Ignium, or Book of Fires, attributed to Marcus Graecus, is a collection of incendiary recipes, including some gunpowder recipes. Partington dates the gunpowder recipes to approximately 1300. One recipe for "flying fire" (ingis volatilis) involves saltpetre, sulfur, and colophonium, which, when inserted into a reed or hollow wood, "flies away suddenly and burns up everything." Another recipe, for artificial "thunder", specifies a mixture of one pound native sulfur, two pounds linden or willow charcoal, and six pounds of saltpeter. Another specifies a 1:3:9 ratio. Some of the gunpowder recipes of De Mirabilibus Mundi of Albertus Magnus are identical to the recipes of the Liber Ignium, and according to Partington, "may have been taken from that work, rather than conversely." Partington suggests that some of the book may have been compiled by Albert's students, "but since it is found in thirteenth century manuscripts, it may well be by Albert. "Albertus Magnus died in 1280. A common German folk-tale is of the German priest/monk named Berthold Schwarz who independently invented gunpowder, thus earning it the German name Schwarzpulver or in English Schwarz's powder. Schwarz is also German for black so this folk-tale, while likely containing elements of truth, is considered problematic. A major advance in manufacturing began in Europe in the late 14th century when the safety and thoroughness of incorporation was improved by wet grinding; liquid, such as distilled spirits or perhaps the urine of wine-drinking bishops was added during the grinding-together of the ingredients and the moist paste dried afterwards. (The principle of wet mixing to prevent the separation of dry ingredients, invented for gunpowder, is used today in the pharmaceutical industry.) It was also discovered that if the paste was rolled into balls before drying the resulting gunpowder absorbed less water from the air during storage and traveled better. The balls were then crushed in a mortar by the gunner immediately before use, with the old problem of uneven particle size and packing causing unpredictable results. If the right size particles were chosen, however, the result was a great improvement in power. Forming the damp paste into corn-sized clumps by hand or with the use of a sieve instead of larger balls produced a product after drying that loaded much better, as each tiny piece provided its own surrounding air space that allowed much more rapid combustion than a fine powder. This "corned" gunpowder was from 30% to 300% more powerful. An example is cited where 34 pounds of serpentine was needed to shoot a 47 pound ball, but only 18 pounds of corned powder. The optimum size of the grain depended on its use; larger for large cannon, finer for small arms. Larger cast cannon were easily muzzle-loaded with corned powder using a long-handled ladle. Corned powder also retained the advantage of low moisture absorption, as even tiny grains still had much less surface area to attract water than a floury powder. During this time, European manufacturers also began regularly purifying saltpeter, using wood ashes containing potassium carbonateto precipitate calcium from their dung liquor, and using ox blood, alum, and slices of turnip to clarify the solution. The art of gunpowder-making and metal-smelting and casting for shot and cannon was closely held by skilled military tradesmen, who formed guilds which collected dues, tested apprentices, and gave pensions. "Fire workers" were also required to craft fireworks for celebrations of victory or peace. During the Renaissance, two European schools of pyrotechnic thought emerged, one in Italy and the other at Nuremberg, Germany. The Italian school of pyrotechnics emphasized elaborate fireworks, and the German school stressed scientific advancement. Vannoccio Biringuccio, born in 1480, was a member of the guild Fraternita di Santa Barbara but broke with the tradition of secrecy by setting down everything he knew in a book titled De la pirotechnia, written in vernacular. The first printed book on either gunpowder or metalworking, it was published posthumously in 1540, with 9 editions over 138 years, and also reprinted byMIT Press in 1966. By the mid-17th century fireworks were used for entertainment on an unprecedented scale in Europe, being popular even at resorts and public gardens. In 1774 Louis XVI ascended to the throne of France at age 20. After he discovered that France was not self-sufficient in gunpowder, a Gunpowder Administration was established; to head it, the lawyer Antoine Lavoisier was appointed. Although from a bourgeois family, after his degree in law Lavoisier became wealthy from a company set up to collect taxes for the Crown; this allowed him to pursue experimental natural science as a hobby. Gunpowder production in Britain appears to have started in the mid 14th century AD with the aim of supplying The English Crown.Records show that gunpowder was being made, in England, in 1346, at the Tower of London; a powder house existed at the Tower in 1461; and in 1515 three King's gunpowder makers worked there. Gunpowder was also being made or stored at other Royal castles, such as Portchester. By the early 14th century, according to N.J.G. Pounds's study The Medieval Castle in England and Wales, many English castles had been deserted and others were crumbling. Their military significance faded except on the borders. Gunpowder had made smaller castles useless. Henry VIII of England was short of gunpowder when he invaded France in 1544 AD and England needed to import gunpowder via the port of Antwerp. The English Civil War, 1642–1645, led to an expansion of the gunpowder industry, with the repeal of the Royal Patent in August 1641. Two British physicists, Andrew Noble and Frederick Abel, worked to improve the properties of black powder during the late 19th century. This formed the basis for the Noble-Abel gas equation for internal ballistics. The introduction of smokeless powder in the late 19th century led to a contraction of the gunpowder industry. After the end of World War I, the majority of the United Kingdom gunpowder manufacturers merged into a single company, "Explosives Trades limited"; and number of sites were closed down, including those in Ireland. This company became Nobel Industries Limited; and in 1926 became a founding member of Imperial Chemical Industries. The Home Office removed gunpowder from its list of Permitted Explosives; and shortly afterwards, on 31 December 1931, the former Curtis & Harvey's Glynneath gunpowder factory at Pontneddfechan, in Wales, closed down, and it was demolished by fire in 1932. The last remaining gunpowder mill at the Royal Gunpowder Factory, Waltham Abbey was damaged by a German parachute mine in 1941 and it never reopened. This was followed by the closure of the gunpowder section at the Royal Ordnance Factory, ROF Chorley, the section was closed and demolished at the end of World War II; and ICI Nobel's Roslin gunpowder factory which closed in 1954. This left the sole United Kingdom gunpowder factory at ICI Nobel's Ardeer site in Scotland; it too closed in October 1976. Since then gunpowder has been imported into the United Kingdom. In the late 1970s / early 1980s gunpowder was bought from eastern Europe, particularly from what was then the East Germany and former Yugoslavia. It was written in the Tarikh-i Firishta (1606–1607) that Nasir ud din Mahmud the ruler of the Delhi Sultanate presented the envoy of the Mongol ruler Hulegu Khan with a dazzling pyrotechnics display upon his arrival in Delhi in 1258 AD. Nasir ud din Mahmud tried to express his strength as a ruler and tried to ward off any Mongol attempt similar to the Siege of Baghdad (1258). Firearms known astop-o-tufak also existed in many Muslim kingdoms in India by as early as 1366 AD. From then on the employment of gunpowder warfare in India was prevalent, with events such as the "Siege of Belgaum" in 1473 by Sultan Muhammad Shah Bahmani. But it was the Mughal Emperor Akbar who mass-produced matchlocks in the Mughal Army. Akbar is personally known to have shot a leading Rajput commander during the Siege of Chittorgarh. The Mughals then began to utilize Bamboo rocket (mainly used for signalling) and Sappers were special units that laid gunpowder under heavy stone fortifications. The Mughal Emperor Shah Jahan is known to have introduced much more advanced Matchlocks, their designs were a combination ofOttoman and Mughal designs. Shah Jahan also countered the British and other Europeans in his province of Gujarāt, which supplied Europe saltpeter for use in gunpowder warfare during the 17th century. Bengal and Mālwa participated in saltpeter production.The Dutch, French, Portuguese, and English used Chhapra as a center of saltpeter refining. Ever since the founding of the Sultanate of Mysore by Hyder Ali, French military officers were employed to train the Mysore Army. Hyder Ali and his son Tipu Sultan were the first to introduce modern Cannons and Muskets, their army was also the first in India to have official uniforms. During the Second Anglo-Mysore War Hyder Ali and his son Tipu Sultan unleashed the Mysorean rockets at their British opponents effectively defeating them on various occasions. The Mysorean rockets inspired the development of theCongreve rocket, which the British widely utilized during the Napoleonic Wars and the War of 1812. The Javanese Majapahit Empire was arguably able to encompass much of modern day Indonesia due to its unique mastery of bronze smithing and use of a central arsenal fed by a large number of cottage industries within the immediate region. Documentary and archeological evidence indicate that Arab or Indian traders introduced gunpowder, gonnes, muskets, blunderbusses, and cannon to the Javanese, Acehnese, and Batak via long established commercial trade routes around the early to mid 14th century CE.Portuguese and Spanish invaders were unpleasantly surprised and occasionally even outgunned on occasion. The resurgentSinghasari Empire overtook Sriwijaya and later emerged as the Majapahit whose warfare featured the use of fire-arms and cannonade. Circa 1540 CE the Javanese, always alert for new weapons found the newly arrived Portuguese weaponry superior to that of the locally made variants. Javanese bronze breech-loaded swivel-guns, known as meriam, or erroneously as lantaka, was used widely by the Majapahit navy as well as by pirates and rival lords. The demise of the Majapahit empire and the dispersal of disaffected skilled bronze cannon-smiths to Brunei, modern Sumatra, Malaysia and the Philippines lead to widespread use, especially in theMakassar Strait. A Chinese pirate or commercial shipwreck site[where?] yielded a paired swivel gun, for rapid firing: one barrel would fire whiles its opposite was being reloaded, though this remains a rare find. Other archaeological finds have unearthed triple-barrel and double-barrel swivel-guns, though they were not widely duplicated. Saltpetre harvesting was recorded by Dutch and German travelers as being common in even the smallest villages and was collected from the decomposition process of large dung hills specifically piled for the purpose. The Dutch punishment for possession of unpermitted gunpowder appears to have been amputation. [unreliable source?] Ownership and manufacture of gunpowder was later prohibited by the colonial Dutch occupiers. According to a colonel McKenzie quoted in Sir Thomas Stamford Raffles, The History of Java (1817), the purest sulphur was supplied from a crater from a mountain near the straits of Bali. For the most powerful black powder meal, a wood charcoal is used. The best wood for the purpose is Pacific willow, but others such as alder or buckthorn can be used. In Great Britain between the 15th to 19th centuries charcoal from alder buckthorn was greatly prized for gunpowder manufacture; cottonwood was used by the American Confederate States. The ingredients are reduced in particle size and mixed as intimately as possible. Originally this was with a mortar-and-pestle or a similarly operating stamping-mill, using copper, bronze or other non-sparking materials, until supplanted by the rotating ball mill principle with non-sparking bronze orlead. Historically, a marble or limestone edge runner mill, running on a limestone bed was used in Great Britain; however, by the mid 19th century AD this had changed to either an iron shod stone wheel or a cast iron wheel running on an iron bed. The mix was dampened with alcohol or water during grinding to prevent accidental ignition. This also helps the extremely soluble saltpeter mix into the microscopic nooks and crannies of the very high surface-area charcoal. Around the late 14th century AD, European powdermakers first began adding liquid during grinding to improve mixing, reduce dust, and with it the risk of explosion. The powdermakers would then shape the resulting paste of dampened gunpowder, known as mill cake, into corns, or grains, to dry. Not only did corned powder keep better because of its reduced surface area, gunners also found that it was more powerful and easier to load into guns. Before long, powdermakers standardized the process by forcing mill cake through sieves instead of corning powder by hand. The improvement was based on having a reduced surface area of a higher density composition. At the beginning of the 19th century, density was increased further by static pressing. Shoveling the damp mill cake into a two-foot square box, this was placed beneath a screw press and reduced to 1/2 its volume. "Presscake" had the hardness of slate; the dried slabs were then broken with hammers or with rollers, and the granules sorted with sieves into different grades. In the United States, Irenee du Pont, who had learned the trade from Lavoisier, tumbled the dried grains in rotating barrels to round the edges and increase its durability during shipping and handling. Sharp grains would round off in transport, producing fine "meal dust" which changes the burning properties. Another advance was the manufacture of kiln charcoal by distilling wood in heated iron retorts instead of burning it in earthern pits; controlling the temperature influenced the power and consistency of the finished gunpowder. In 1863, in response to high prices for Indian saltpeter, DuPont chemists developed a process using potash or mined potassium chloride to convert plentiful Chilean sodium nitrate to potassium nitrate. During the 18th century gunpowder factories became increasingly dependent on mechanical energy. Despite mechanization, production difficulties related to humidity control, especially during the pressing, were still present in the late 19th century. A paper from 1885 laments that "Gunpowder is such a nervous and sensitive spirit, that in almost every process of manufacture it changes under our hands as the weather changes." Pressing times to the desired density could vary by factor of three depending on the atmospheric humidity. The term black powder was coined in the late 19th century, primarily in the United States, to distinguish prior gunpowder formulations from the new smokeless powders and semi-smokeless powders, in cases where these are not referred to as cordite. Semi-smokeless powders featured bulk volume properties that approximated black powder, but had significantly reduced amounts of smoke and combustion products. Smokeless powder has different burning properties (pressure vs. time) and can generate higher pressures and work per gram. This can rupture older weapons designed for black powder. Smokeless powders ranged in colour from brownish tan to yellow to white. Most of the bulk semi-smokeless powders ceased to be manufactured in the 1920s. sulfur (S), which, while also serving as a fuel, lowers the temperature required to ignite the mixture, thereby increasing the rate of combustion. Potassium nitrate is the most important ingredient in terms of both bulk and function because the combustion process releases oxygen from the potassium nitrate, promoting the rapid burning of the other ingredients. To reduce the likelihood of accidental ignition by static electricity, the granules of modern black powder are typically coated with graphite, which prevents the build-up of electrostatic charge. Charcoal does not consist of pure carbon; rather, it consists of partially pyrolyzed cellulose, in which the wood is not completely decomposed. Carbon differs from charcoal. Whereas charcoal's autoignition temperature is relatively low, carbon's is much greater. Thus, a black powder composition containing pure carbon would burn similarly to a match head, at best. The current standard composition for the black powders that are manufactured by pyrotechnicians was adopted as long ago as 1780. Proportions by weight are 75% potassium nitrate (known as saltpeter or saltpetre), 15% softwood charcoal, and 10% sulfur. These ratios have varied over the centuries and by country, and can be altered somewhat depending on the purpose of the powder. For instance, power grades of black powder, unsuitable for use in firearms but adequate for blasting rock in quarrying operations, is called blasting powder rather than gunpowder with standard proportions of 70% nitrate, 14% charcoal, and 16% sulfur; blasting powder may be made with the cheaper sodium nitrate substituted for potassium nitrate and proportions may be as low as 40% nitrate, 30% charcoal, and 30% sulfur. In 1857 Lamont DuPont solved the main problem when using cheaper sodium nitrate formulations when he patented DuPont "B" Blasting powder; after manufacturing grains from press-cake in the usual way, the powder was tumbled with graphite dust for 12 hours, forming a coating on each grain which in this case reduced its ability to pick up moisture. French war powder in 1879 used the ratio 75% saltpeter, 12.5% charcoal, 12.5% sulfur. English war powder in 1879 used the ratio 75% saltpeter, 15% charcoal, 10% sulfur. The British Congreve rockets used 62.4% saltpeter, 23.2% charcoal and 14.4% sulfur, but the British Mark VII gunpowder was changed to 65% saltpeter, 20% charcoal and 15% sulfur. The explanation for the wide variety in formulation relates to usage. Powder used for rocketry can use a slower burn rate since it will accelerate the projectile for a much longer period of time, whereas powders for use in weapons such as flintlocks, caplocks or matchlocks need a higher burn rate since they must accelerate the projectile in a much shorter distance. Cannons usually used lower burn rate powders because most would burst if higher burn rate powders are used. The original dry-compounded powder used in fifteenth-century Europe was known as "Serpentine", either a reference to Satan or to a common artillery piece that used it. The ingredients were ground together with a mortar and pestle, perhaps for 24 hours,resulting in a fine flour. Vibration during transportation could cause the components to separate again, requiring remixing in the field. Also if the quality of the saltpeter was low (for instance if it was contaminated with highly hygroscopic calcium nitrate), or if the powder was simply old (due to the mildly hygroscopic nature of potassium nitrate), in humid weather it would need to be redried. The dust from "repairing" powder in the field was a major hazard. Loading cannon or bombards before the powdermaking advances of the Renaissance was a skilled art. Fine powder loaded haphazardly or too tightly would burn incompletely or too slowly. Typically, the breech-loading powder chamber in the rear of the piece was filled only about half full, the serpentine powder neither too compressed nor too loose, a wooden bung pounded in to seal the chamber from the barrel when assembled, and the projectile placed on that. A carefully determined empty space was necessary for the charge to burn effectively. When the cannon was fired through the touchhole, turbulence from the initial surface combustion caused the rest of the powder to be rapidly exposed to the flame. The advent of much more powerful and easy to use corned powder changed this procedure, but serpentine was used with older guns into the seventeenth century. In order for gunpowder to explode effectively, the combustible mixture needs to be reduced to the smallest possible particle sizes and as intimately mixed with one another as possible. But once mixed, for better results in a gun it was discovered that the final product should be in the form of individual, dense, grains which allow the fire to spread quickly from grain to grain, much as straw or twigscatch fire more quickly than a pile of sawdust. Primarily for safety reasons, size reduction and mixing is done while the ingredients are damp, usually with water. After 1800, instead of forming grains by hand or with sieves, the damp millcake was pressed in molds to increase its density and extract the liquid, formingpresscake. The pressing took varying amounts of time, depending on conditions such as atmospheric humidity. The hard, dense product was then broken again into tiny pieces which were separated with sieves to have a uniform product for each purpose; coarse powders were used for cannons, finer grained powders for muskets, and the finest for small hand guns and priming.Inappropriately fine-grained powder often caused cannons to burst before the projectile could move down the barrel, due to the high initial spike in pressure. Mammoth powder with large grains made for Rodman's 15-inch cannon reduced the pressure to only 20 percent as high as ordinary cannon powder would have produced. In the mid-nineteenth century, measurements were made determining that the burning rate within a grain of black powder (or a tightly packed mass) is about 0.20 fps, while the rate of ignition propagation from grain to grain is around 30 fps, over two orders of magnitude faster. Modern corning first compresses the fine black powder meal into blocks with a fixed density (1.7 g/cm³). In the United States, gunpowder grains were designated F (for fine) or C (for coarse). Grain diameter decreased with a larger number of Fs and increased with a larger number of Cs, ranging from about 2 mm for 7F to 15 mm for 7C. Even larger grains were produced for artillery bore diameters greater than about 17 cm (6.7 in). The standard DuPont Mammoth powder developed by Thomas Rodman and Lammot du Pont for use during the American Civil War had grains averaging 0.6 inches diameter, with edges rounded in a glazing barrel. Other versions had grains the size of golf and tennis balls for use in 20-inch (50-cm) Rodman guns. In 1875 DuPont introducedHexagonal powder for large artillery, which was pressed using shaped plates with a small center core; about 1.5 inches diameter, like a wagon wheel nut, the center hole widened as the grain burned. By 1882 German makers also produced hexagonal grained powders of a similar size for artillery. 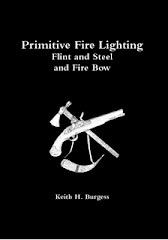 By the late 19th century manufacturing focused on standard grades of black powder from Fg used in large bore rifles and shotguns, through FFg (medium and smallbore arms such as muskets and fusils), FFFg (smallbore rifles and pistols), and FFFFg (extreme small bore, short pistols and most commonly for priming flintlocks). A coarser grade for use in military artillery blanks was designated A-1. These grades were sorted on a system of screens with oversize retained on a mesh of 6 wires per inch, A-1 retained on 10 wires per inch, Fg retained on 14, FFg on 24, FFFg on 46, and FFFFg on 60. Fines designated FFFFFg were usually reprocessed to minimize explosive dust hazards. In the United Kingdom, the main service gunpowders were classified RFG (rifle grained fine) with diameter of one or two millimeters and RLG (rifle grained large) for grain diameters between two and six millimeters. Gunpowder grains may alternatively be categorised by mesh size: the BSS sieve mesh size, being the smallest mesh size on which no grains were retained. Recognised grain sizes are Gunpowder G 7, G 20, G 40, and G 90. Owing to the large market of antique and replica black-powder firearms in the US, modern gunpowder substitutes like Pyrodex, Triple Seven and Black Mag3 pellets have been developed since the 1970s. These products, which should not be confused with smokeless powders, aim to produce less fouling (solid residue), while maintaining the traditional volumetric measurement system for charges. Claims of less corrosiveness of these products have been controversial however. New cleaning products for black-powder guns have also been developed for this market. Besides black powder, there are other historically important types of gunpowder. "Brown gunpowder" is cited as composed of 79% nitre, 3% sulphur, and 18% charcoal per 100 of dry powder, with about 2% moisture. Prismatic Brown Powder is a large-grained product the Rottweil Company introduced in 1884 in Germany, which was adopted by the British Royal Navy shortly thereafter. The French navy adopted a fine, 3.1 millimeter, not prismatic grained product called Slow Burning Cocoa (SBC) or "cocoa powder". These brown powders reduced burning rate even further by using as little as 2 percent sulfur and using charcoal made from rye straw that had not been completely charred, hence the brown color. Lesmok powder was a product developed by DuPont in 1911 one of several semismokeless products in the industry containing a mixture of black and nitrocellulose powder. It was sold to Winchester and others primarily for .22 and .32 small calibres. Its advantage was that it was less corrosive than smokeless powders then in use as the bulkier load carried away more of the primer residue, and somewhat less fouling than straight black powder in that the bore did not require cleaning after every shot. It was last sold by Winchester in 1947. The development of smokeless powders, such as cordite, in the late 19th century created the need for a spark-sensitive priming charge, such as gunpowder. However, the sulfur content of traditional gunpowders caused corrosion problems with Cordite Mk I and this led to the introduction of a range of sulfur-free gunpowders, of varying grain sizes. They typically contain 70.5 parts of saltpetre and 29.5 parts of charcoal. Like black powder, they were produced in different grain sizes. In the United Kingdom, the finest grain was known as sulfur-free mealed powder (SMP). Coarser grains were numbered as sulfur-free gunpowder (SFG n): 'SFG 12', 'SFG 20', 'SFG 40' and 'SFG 90', for example; where the number represents the smallest BSS sieve mesh size on which no grains were retained. Although charcoal's chemical formula varies, it can be best summed up by its empirical formula: C7H4O. The burning of gunpowder does not take place as a single reaction, however, and the byproducts are not easily predicted. One study's results showed that it produced (in order of descending quantities) 55.91% solid products: potassium carbonate, potassium sulfate, potassium sulfide, sulfur, potassium nitrate, potassium thiocyanate, carbon, ammonium carbonate and 42.98% gaseous products: carbon dioxide, nitrogen, carbon monoxide, hydrogen sulfide, hydrogen, methane, 1.11% water. Black powder made with less-expensive and more plentiful sodium nitrate (in appropriate proportions) works just as well but is morehygroscopic than powders made from Potassium nitrate—popularly known as saltpeter. Because corned black powder grains made with saltpeter are less affected by moisture in the air, they can be stored unsealed without degradation by humidity. Muzzleloadershave been known to fire after hanging on a wall for decades in a loaded state, provided they remained dry. By contrast, black powder made with sodium nitrate must be kept sealed to remain stable. Gunpowder contains 3 megajoules per kilogram, and contains its own oxidant. For comparison, the energy density of TNT is 4.7 megajoules per kilogram, and the energy density of gasoline is 47.2 megajoules per kilogram. Gunpowder is a low explosive and as such it does not detonate; rather it deflagrates. Since it contains its own oxidizer and additionally burns faster under pressure, its combustion is capable of rupturing containers such as shell, grenade, or improvised "pipe bomb" or "pressure cooker" casings, forming shrapnel. In quarrying, high explosives are generally preferred for shattering rock. However, because of its low brisance, black powder causes fewer fractures and results in more usable stone compared to other explosives, making black powder useful for blasting monumental stone such as granite and marble. Black powder is well suited for blank rounds, signal flares, burst charges, and rescue-line launches. Black powder is also used in fireworks for lifting shells, in rockets as fuel, and in certain special effects. Black powder has a low energy density compared to modern "smokeless" powders, and thus to achieve high energy loadings, large amounts of black powder are needed with heavy projectiles. In military applications black powder also produces thick smoke as a byproduct, which may give a soldier's location away to an enemy observer. The smoke may also impair aiming for additional shots. Combustion converts less than half the mass of black powder to gas. The rest ends up as a thick layer of soot inside the barrel. In addition to being a nuisance, the residue from burnt black powder is hygroscopic and with the addition of moisture absorbed from the air, this residue forms a caustic substance. The soot contains potassium oxide or sodium oxide that turns into potassium hydroxide, orsodium hydroxide, which will corrode wrought iron or steel gun barrels. Black powder arms must be well cleaned both inside and out to remove the residue. The matchlock musket or pistol (an early gun ignition system), as well as the flintlock would often be unusable in wet weather, due to powder in the pan being exposed and dampened. Because of this unreliability, soldiers carrying muskets, known as musketeers, were armed with additional weapons such as swords or pikes. The bayonet was developed to allow the musket to be used as a pike, thus eliminating the need for the soldier to carry a secondary weapon. The United Nations Model Regulations on the Transportation of Dangerous Goods and national transportation authorities, such asUnited States Department of Transportation, have classified gunpowder (black powder) as a Group A: Primary explosive substance for shipment because it ignites so easily. Complete manufactured devices containing black powder are usually classified as Group D: Secondary detonating substance, or black powder, or article containing secondary detonating substance, such as firework, class Dmodel rocket engine, etc., for shipment because they are harder to ignite than loose powder. As explosives, they all fall into the category of Class 1. Besides its use as an explosive, gunpowder has been occasionally employed for other purposes; after the Battle of Aspern-Essling(1809), the surgeon of the Napoleonic Army Larrey combated the lack of food for the wounded under his care by preparing a bouillonof horse meat seasoned with gunpowder for lack of salt. It was also used for sterilizing on ships when there was no alcohol. Jack Tars (British sailors) used gunpowder to create tattoos when ink wasn't available, by pricking the skin and rubbing the powder into the wound in a method known as traumatic tatooing. Christiaan Huygens experimented with gunpowder in 1673 in an early attempt to build an internal combustion engine, but he did not succeed. Modern attempts to recreate his invention were similarly unsuccessful. Fireworks use gunpowder as lifting and burst charges, although sometimes other more powerful compositions are added to the burst charge to improve performance in small shells or provide a louder report. Most modern firecrackers no longer contain black powder. Beginning in the 1930s, gunpowder or smokeless powder was used in rivet guns, stun guns for animals, cable splicers and other industrial construction tools. The "stud gun" drove nails or screws into solid concrete, a function not possible with hydraulic tools. See Powder-actuated tool. Shotguns have been used to eliminate persistent material rings in operating rotary kilns (such as those for cement, lime, phosphate, etc.) and clinker in operating furnaces, and commercial tools make the method more reliable. Near London in 1853, Captain Shrapnel (presumably a grandson of the inventor of the Shrapnel shell) demonstrated a method for crushing gold-bearing ores by firing them from a cannon into an iron chamber, and "much satisfaction was expressed by all present". He hoped it would be useful on the goldfields of California and Australia. Nothing came of the invention, as continuously-operating crushing machines which achieved more reliable comminution were already coming into use. Khan, Iqtidar Alam (1996a). "The Role of the Mongols in the Introduction of Gunpowder and Firearms in South Asia". Chapter 3, In Buchanan, Brenda J. (1996). Gunpowder: The History of an International Technology. Bath: Bath University Press. (. 2006 re-issue). Ballistics of 17th Century Muskets PDF. UPDATE On Petition. Please Sign.